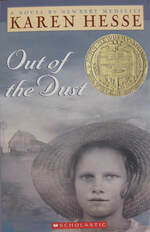 This is a historical fiction book with a fantasy element, by the author of Esperanza Rising and Paint the Wind. Three main stories (a fourth provides bookends) are connected by the thread of a single harmonica. In Germany, Friedrich has always felt isolated because of a birthmark on his face and neck, but also because of his connection to music. Sometimes he hears it in his head and can't stop himself from conducting - even though no instruments are playing nearby. This makes him a target for bullies, and life gets even more complicated when his older sister, Elisabeth, leaves home. She and their father disagree about how to survive in Hitler's Germany - she is willing to comply with rules and fit in, rather than stand up and dissent. Friedrich's father cannot understand this. Mike and his younger brother are in an orphanage in the Great Depression in the United States. Mike does his best to protect his younger brother, but things aren't easy. When the orphanage gets a donated piano, it's a reminder of what home used to be for Mike. Could his playing be their ticket out of the orphanage and into a family again? Ivy and her family are forced to move to a new school. She will have to miss playing the solo part at her old school, something her parents don't seem to take as seriously as her brother's athletic talents. She is hopeful about opportunities at her new school, but soon discovers that, as a Latina student, her school does not offer as much as the one her white neighbor attends. Ivy also discovers the injustice of Japanese families forcibly removed from their homes during WWII, as she explores her new town. How can something like music possibly repair so much that is broken? This is beautifully written, and genre-defying. I think adults should read it so they can remember to appreciate magic and fairy tales, and children should read it so they can learn and consider events in world history, and everyone should read it for the privilege of enjoying the stories. "He was so caught up in the music that he never heard the laughing or the taunting. Or the boys running up behind him. Until it was too late."